How can you prepare babies and children with the faculties they need for successful task completions in school? In daily activities, play and relations, you can exercise the basic functions needed for studying. A very helpful base for working is a daily activity plan with a number of different activities. If the children have attention problems, you should make short periods of concentrated activity, and then a short pause. If you make 20 minute activities, some of the children may have a short attention span and fall out after 8 minutes. So it is better to make 8 minute activities and 5 minute pauses. Before you make the plan, you can look at the children in general and notice how long they usually are able to keep focus on what they are doing. 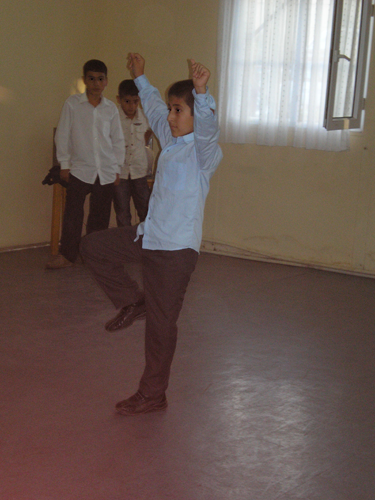 Traditional folk dances combine body control, coordination, concentration, memory, following a verbal instruction, etc. Many traditional songs for children also have an element of controlling your fingers as you sing (“This little piggy went to market, this little piggy.., etc.)”. Other songs are very good for exercising memory because you have to remember a lot of verses. The point is that whatever practical task or routine you have, you can relate to the child in ways that support these functions. For example if you want to make a child interested in a book or a toy, you start by making the child look at you, get its attention and make it feel secure before you point at the toy or the book. In this way, you make a mini secure base supporting the exploration and study. If you look at this video you can see that the caregiver touches the child often, and while she touches the child, she tries to make the child look at herself and catch the attention of the child and have eye contact. Her voice expresses what she feels and the words correspond with the feeling. She also talks about how she thinks the baby may be feeling. In the long run this helps the baby know what it feels and makes it able to describe this to others. When you sit and talk to a child (you can go down on your knees to be face to face or sit on chairs, you hold its hand or touch its shoulder while you talk. Then you talk about what you are going to do together and how to do it, and then you start the activity. Whatever you do you can try to keep the child’s interest a little longer every time you do it to prolong concentration. “This book is heavy, can you feel that? And how many colours can you find in this picture? – shall we count them?”. This also supports the child’s ability to pay attention to what it can sense and understand even small differences between things (aesthetic sense). These exercises should be playful and with a joyful spirit. You can of course do any of them as group exercises: a group of babies or toddlers can sit on the floor in a half circle around the caregiver, sing and imitate what the caregiver is doing, watch while she talks about something she has in her hand, or listen to storytelling. For recognition she can play peek-a-boo with babies, or show them toys which she then hides away, and let the babies crawl around and find them. For toddlers she can do the same or play hide-and-seek with them. This helps the children understand that the caregiver exists and offers security even though she is out of sight. She can show things, then hide them and ask the children to describe what they look, what colours they have, how heavy they are, etc. to support memory and recognition. She can take a number of objects, place them on the floor and ask the children to answer one by one so they learn to wait for their turn: “Can you tell me which one is bigger and which one is smaller?” “And you, can you tell me which one is square and which one is round?” – “And you, which one is soft when you touch it and which one is hard?” – “And you, what do you think will happen if I put this toy on top of this toy?”. In this way she exercises frustration tolerance (you must wait for your turn), predicting relations between things (what will happen if I put one on top of another), and differences between things (soft, hard, smooth, cold, warm, etc.). She can play with the children about relations between them: “You all stand by the wall now, and I stand here. The one who can move most slowly to me wins the prize!” – “The one who can get first to me wins the prize!” – “The one who can walk backwards to me without looking over the shoulder wins the prize!” – “The one who can come to me as number three wins the prize”. She can make different facial expressions (very: angry, sad, happy, wondering, crying, listening) and ask the children to find words that describe the feelings. She can ask the children to guess what other children are feeling or thinking of. Like in the game “What animal am I thinking of now?”, and the children can ask how many legs it has, if it has teeth, if it lives in water or on land, the caregiver answers yes or no, until one of them guesses it. How can we make an activity plan that includes exercising these functions? How long can our children concentrate at the moment? So, how long should activities and pauses be in general in order to stop before the children are too exhausted? When they have the small pauses, how can we let them use their body freely (run, hop, swing, skip or other physical activities)? What activities with babies and toddlers do we remember from our own childhood – how can we use them in the activity plan? In what activities can we prolong concentration? What activities can help them focus on persons and objects, and find out what they should focus on and what is not important? What activities can help them recognize persons and objects? What can we do to help them understand the differences between sensations (cold/warm, bright/dark, soft/hard, salt/ sour/sweet, heavy/light ,up/down/forward/backwards, etc. etc.)? What can we do to combine words and emotions? What can we do that makes the children wonder and guess about the feelings and thoughts of others. What can we do to exercise gradually how much frustration and excitement the children can endure (wait for your turn, wait for the word “start” when you run, etc.)? Why do children placed outside home not very often receive education later in life? What are the basic functions of learning – when and from whom do you start to learn them? What should you consider when making an activity plan concerning time? What are the basic functions you can exercise in any activity?